Montana's Yellowstone hosts America's largest herd of bison, and one of the only remaining wild populations left. But now some of their almost 5,000-strong herd is ready to be adopted out. The Yellowstone bison are one of the few herds of bison who have not been hybridized with cattle, that (along with the sheer size of the herd) makes them a seemingly excellent source to expand the gene pool of other bison herds around the U.S. 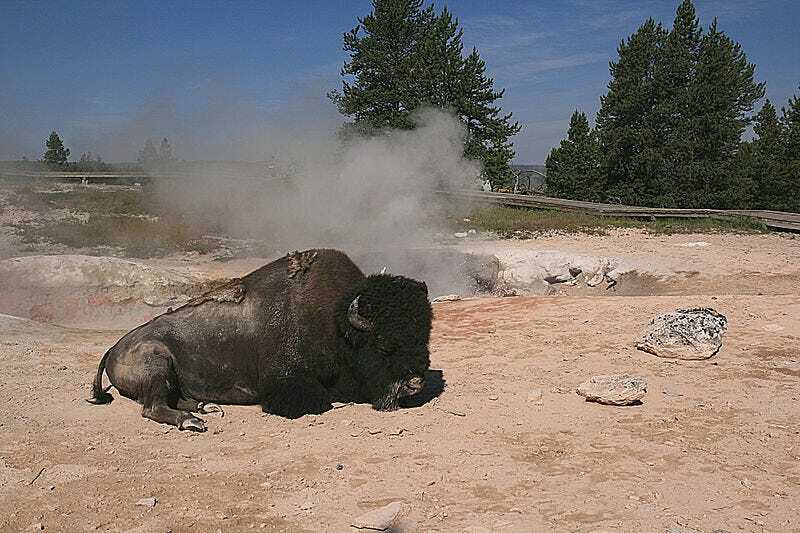 Unfortunately, an infection called brucellosis is also running rampant in Yellowstone's herds, and, as the infection can easily spread to other hoofed animals (including cattle), this has kept the bison firmly at home. Now, however, Reuters reports that after a long quarantine, Montana has a group of 145 of the animals assured to be free of the bacteria and the state is currently considering 10 different proposals to adopt them out to supplement herds in zoos, conservation parks, and tribes in Oklahoma, New York, Utah, and Ohio. These 145 animals were the subject of an extended study in bison-isolation, to see if it was even possible to cull a completely uninfected population out of an already infected herd. After seven years of testing, USDA researchers were finally convinced that they'd done it, as detailed in this study published in the Journal of the American Veterinary Medical Association, and they decreed the bison fit for travel.